The Colonials served up an ace for Senior Day, finishing their regular season by defeating A-10 foe Saint Joseph’s 6-1. It was GW’s fourth consecutive victory, and the lone point the Hawks scored was just the second point the Colonials allowed in four matches. The win also ended Saint Joesph’s own three-match win streak. Getting off to a quick start, the Colonials swept all three doubles matches, just as they did in their last match against Longwood April 6. At the No. 1 spot, junior Mimi Hamling and senior Zoe Krohn defeated their opponents 8-2, after first having to compensate for Saint Joseph’s style of play. Sophomores Isabella Escobar and Leah Pascarella won their No. 2 doubles game 8-6, while seniors Meg Tyner and Jacqueline Corba finished off their opponents with a score of 8-3. Now with an lead, the Colonials sought the same success in singles play. Succumbing the only loss of the day was No. 1 singles player Corba, who stormed out to a 6-0 first set victory, but then faltered in the deciding sets 3-6 and 1-6, respectively. The remaining singles games went more smoothly for GW, as Pascarella posted her fourth straight win with a 6-3, 6-0 mark in the No. 2 slot. Sophomore Julia Blakeley got the win at No. 3 by a score of 6-4, 6-3, while Hamling took her second victory of the day with a mark of 6-1, 6-0 in the No. 4 position. Rounding out the Colonials’ dominant singles play, Escobar kept the team going with a 6-3, 6-0 win in the No. 5 spot, and Tyner finished competition with a victory at No. 6, 6-1, 6-3. The win marked the final home match for seniors Tyner, Krohn, and three-year captain Corba. Tyner posted consistent scores over her tenure at GW, mostly at the No .5 and No. 6 singles positions, including a 13-6 record during her sophomore year after returning from injury. Krohn spent the last three years as a piece of the No. 1 doubles team, nabbing a team-best doubles record of 15-7. Corba, who’s played as the No. 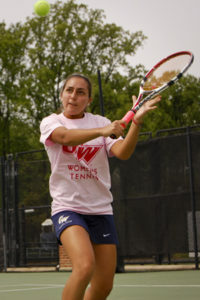 1 singles player since her sophomore year, earned Atlantic 10 All-Conference First Team honors for the past two seasons. Next week, the Colonials move on to the A-10 tournament in Charlottesville, Va., where they hope to improve on their fourth place finish from last season.